A cute and charming Mom cat is nursing her litter of kittens, carrying on the cats to a new generation. This hand-painted enamel on sterling silver cat pin was designed by artist Julie Mammano. 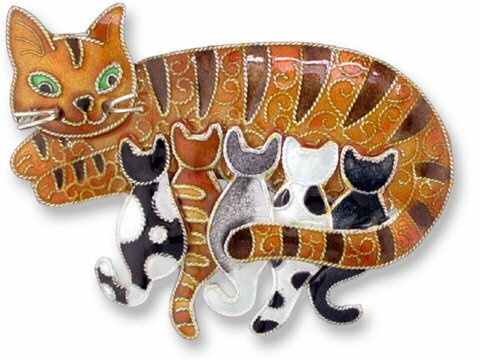 This pin makes a great gift for the cat lover, animal lover or anyone who appreciates fine jewelry.Master artisans paint each article by hand using solutions containing colored granules of glass. Next, they fire the pieces in a kiln to produce an alluring richness of color. Some designs are then plated in 24-karat gold, and some are complemented with beads or semi-precious stones. This process creates the unique Zarah look. This pin is packaged in a silver box with a silver elastic ribbon. A gift ready to give!